Another Twinsie Friday is here, wow I cannot belive how fast time goes by! It's been a month since we started doing these twin posts, doesn't seem like that long, time flyes when you are having fun!!!!!!! So every week right around Wednesday we start talking about what to do with our twin post, its very silly how our conversations go and how we come to conclusions on what do use and do :-P NOW.. coming up with post tittles is even funnier... Maria said it looked like she had gold coins on her nails... we went thru several diferent names until we settled on COIN DROPS... do you agree they look like gold coins?? 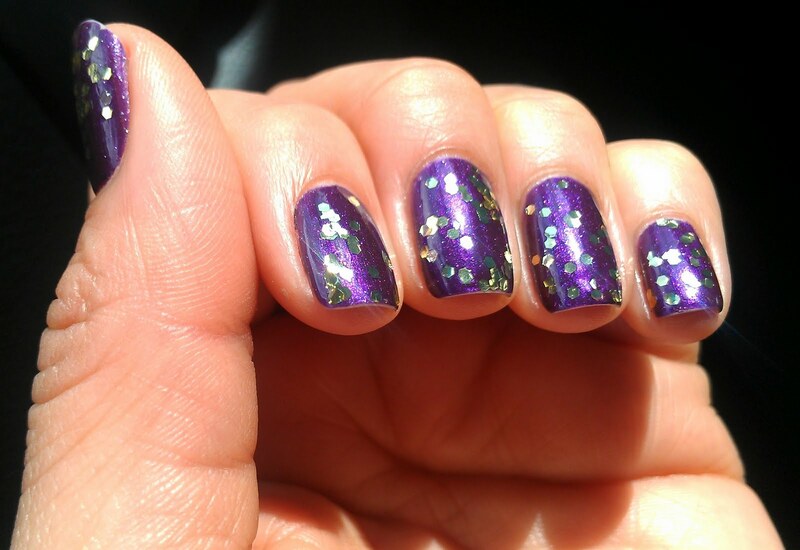 For this mani we still wanted something festive but different and this is what we came up with.. Orly Velvet Rope with Milani Gold Jewel FX aweeeee sooooo preeettty!!! 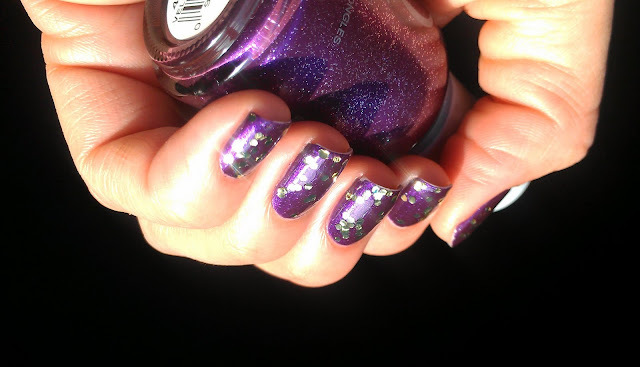 PSS: Lisa at Lisa's Nail Care Blog is having a giveaway for $250 CAD worth of ASK Comestics, check it out!!! Click HERE !!!!! I love it!!!! It does look like coins! That sometimes happens. I've done swatch pics in stores using my phone (Nokia XpressMusic something) and the pics turned out surprisingly colour-accurate. AND sometimes at home you struggle to get realistic colours no matter what camera (my Samsung or my sister's DSLR) you use. 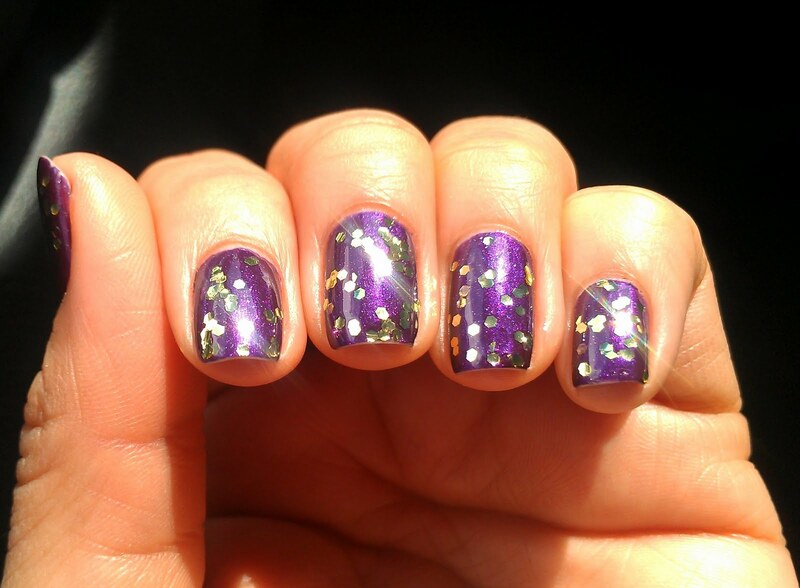 By the way, I'm sporting my first layering using two of the polishes you sent us. Love it. Very nice both ways it was done! and your cell phone pictures are great! i love them! i cant wait for next week! 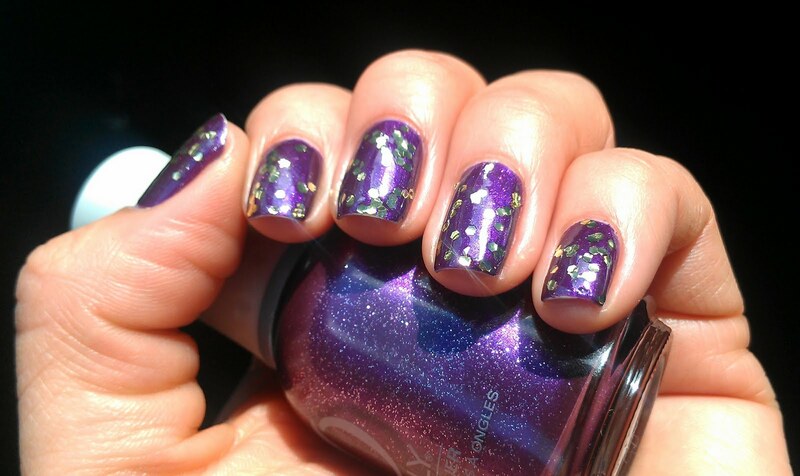 I love that purple and its cool how you caught the light off the glitter-your pictures are so nice! I love it! 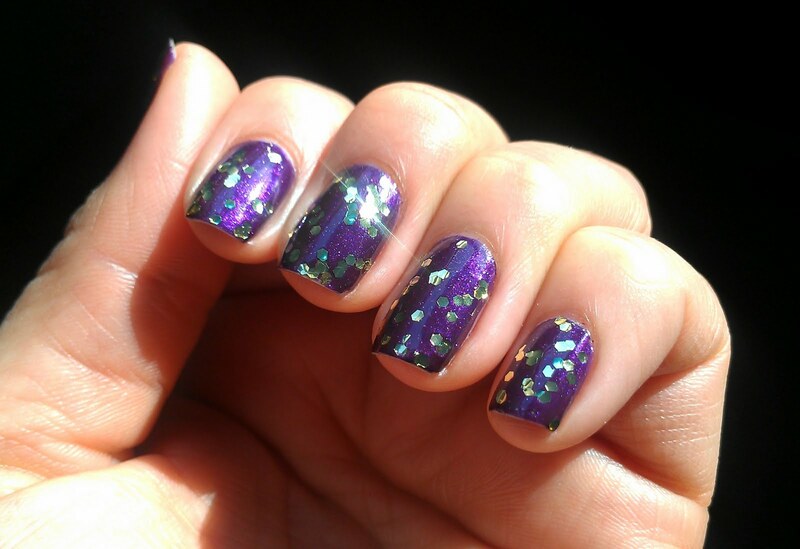 I can see the sun twinkling off of the purple, so sparkly. Phone for all my pics. That purple is gorgeous! Your phone takes amazing pictures! What phone do you use? This is pure perfection!! Loving this!! I wish my phone took pictures that well! =P The purple is gorgeous! Oh wow! That is beautiful! Awesome photos too! Wet n Wild .. new collection??? ?